The story: A new villain, Ivan Vanko, emerges to attack Tony Stark during an auto-race event in Europe, falsely believing Tony Stark’s father betrayed his own. Despite being defeated, he soon escapes jail with the help of rival industrialist Justin Hammer. With declining health and a stubborn attitude about sharing the suit’s technology with the military, Tony’s bad-boy ways lead to Lt. Col. Rhodes seizing one of the suits for the military, and his upgraded weaponry earns him the moniker War Machine. As Tony synthesizes a new element to power his suit and cure the palladium poisoning the previous reactor in his chest was causing, the two join forces to defeat Vanko during the Stark Exposition in New York, while Pepper helps authorities apprehend Hammer. 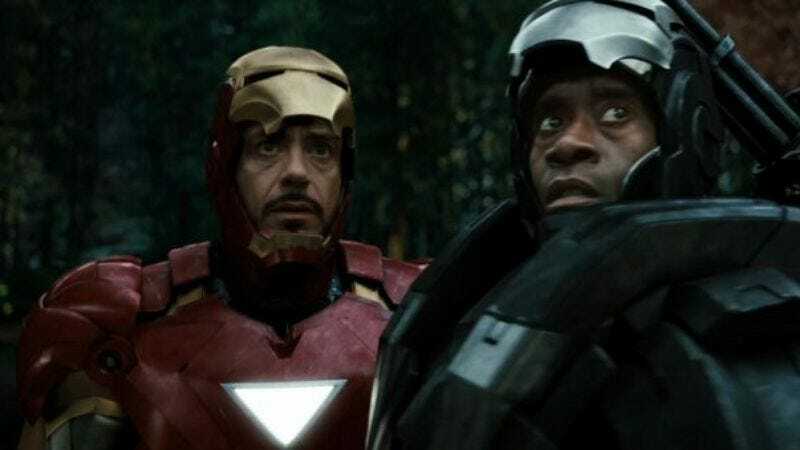 Noteworthy events: Tony makes Pepper the CEO of Stark Industries, and Nick Fury informs Stark that he is no longer being considered as part of the Avengers Initiative. The post-credits stinger reveals Phil Coulson discovering that Thor’s hammer has been found in New Mexico.